Pecco Bagnaia took a dominant win in a sunny, but extremely windy Assen for the Moto2 Dutch TT. Before the race got underway we knew we had lost Niki Tuuli from the race due to his qualifying crash, resulting in him having the tip of his finger amputated. 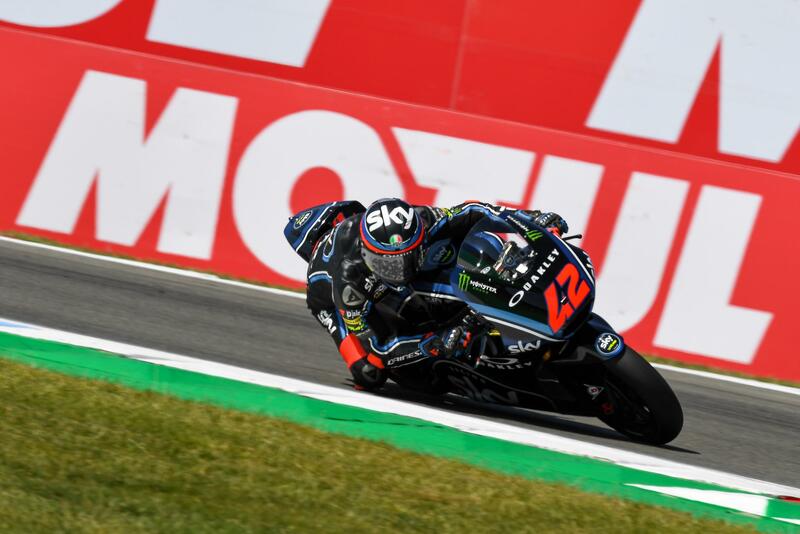 The race got underway with the championship leader Bagnaia on pole, followed by Marcel Schrotter and fellow Sky VR46 rider Luca Marini, the latter’s first front row start. Barcelona winner Fabio Quartararo would start 10th after a three place grid penalty. Bagnaia would take the holeshot, as British hopes took an early hit as Danny Kent hit the floor at turn one, as Joan Mir would work his way up to fourth early doors. Mir would take third very quickly, and would be the man on the move. The only other passer early on was Lorenzo Baldassarri sitting Mattia Pasini up for sixth. Alex Marquez would follow Mir past Marini for fourth place. Four laps in, Bagnaia would attempt to break early, gapping Schrotter by a second as the Marc VDS boys would give chase. The fastest man on track was Baldassarri, and he would have to bridge a small gap to get to the front. The sole remaining British hope, Sam Lowes, would be languishing in 13th place, one position ahead of his team mate Iker Lecuona, as Marquez stamped his authority on his rookie team mate and passed Mir for third place. Stefano Manzi would crash his Suter at turn 10 and be unable to remount, as Schrotter made a mistake on the final chicane allowing Marquez through and putting him into the clutches of Mir. Mir himself would be in the clutches of Baldassarri however, and get passed at the first opportunity. Xavi Vierge would hit the floor at turn one, trail braking just a little too much and folding the front. Baldassarri would pass Schrotter, and knew he had to pass Marquez or Bagnaia would be gone. With 14 laps to go, Baldassarri would show his hand and pass Marquez for second. He was the fastest man on track, and he set off to chase his fellow Italian and flatmate Bagnaia for the lead. The impressive Andrea Locatelli would pass ItalTrans team mate Pasini for tenth, as the race settled into it’s usual lull. Bo Bendsneyder would get a penalty for cutting the chicane in his home race, the Tech 3 rider would be in 21st and a few seconds off the points anyway. Quartararo would stuff it up the inside of Miguel Olivera for sixth place on the Speed Up chassis, as Lowes’ weekend would get even worse, getting a penalty and being forced to drop a position, giving 12th back to Romano Fenati. With eight laps to go, Bagnaia had this under control. Gapping Baldassarri by 0.2 seconds each lap to eke out a gap of nearly 3 seconds. The gaps were remaining consistent, however the fly in everyone’s ointment was Quartararo, catching Mir and dispensing with him almost instantly, and setting off after Schrotter and Marquez for the final podium position. The man who before this weekend was only one point off the championship, Olivera, would be in a very disappointing seventh. With only three laps to go, Baldassarri would suffer heartbreak and get a rear puncture, losing second place in the process. The tyre was completely flat, it seemed to be a tyre failiure. In amongst all this, Quartararo had caught and passed both Schrotter and Marquez to get himself into second place, backing up the win in Barcelona and showing his class. Bagnaia would cross the line to take the win, ahead of Quartararo and Marquez. The luckless Baldassarri would cross the line in 26th place by the finish, having gone back out to try and salvage some points after pitting to change the wheel. With Bagnaia’s win, he would take a commanding 16 point lead from Olivera in the championship standings. Top rookie yet again was Mir, bringing it home in fourth place. The MotoGP paddock moves to Germany next, as we go to the Sachsenring. Will Bagnaia stretch his lead, or will Olivera be able to rein him back in? Find out here on Overtake Motorsport!